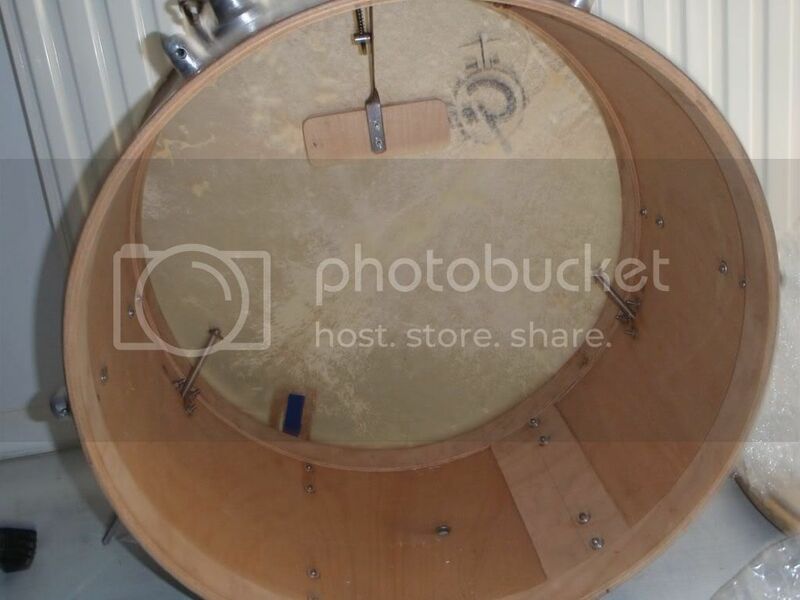 I did some more research and 2 well-known German vintage-drum experts (Ingo Winterberg and Fritz Steger) say it's a DERI. The colour is indeed definately tta Schwarz. Confusing, but very interesting!!! We'll get there!!! Thanks a lot for you help!!! I'll make pics of the inside of the shell later today. Do you want to see the tom, bass or both? Here are some pics of the set how i use it. I don't use the tom, but only the base with the cymbal. 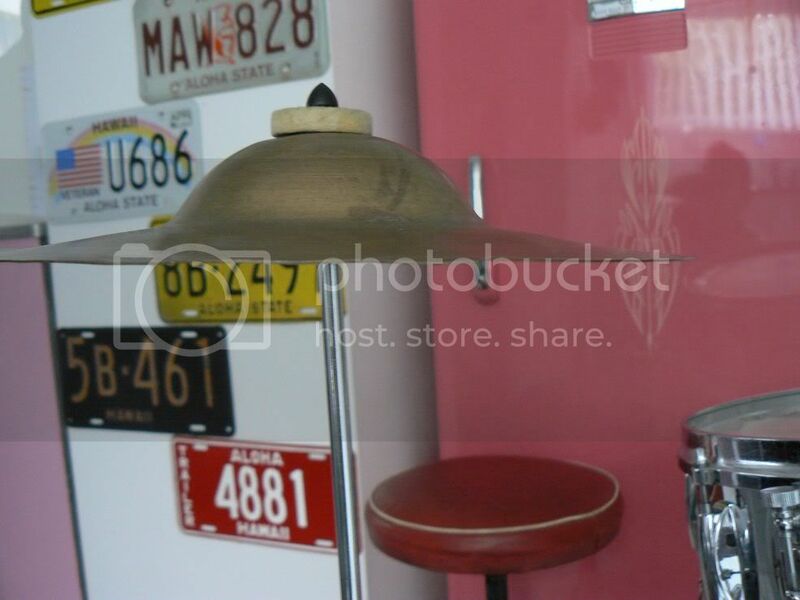 The Gretsch-decal will be taken off soon...it was already on when i bought it. 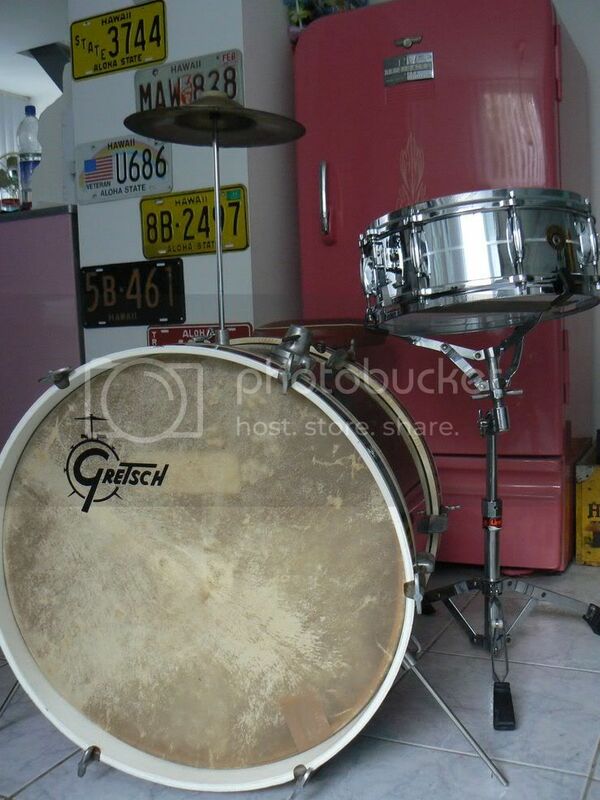 The snare i use is a 1969 Gretsch roundbadge COB. 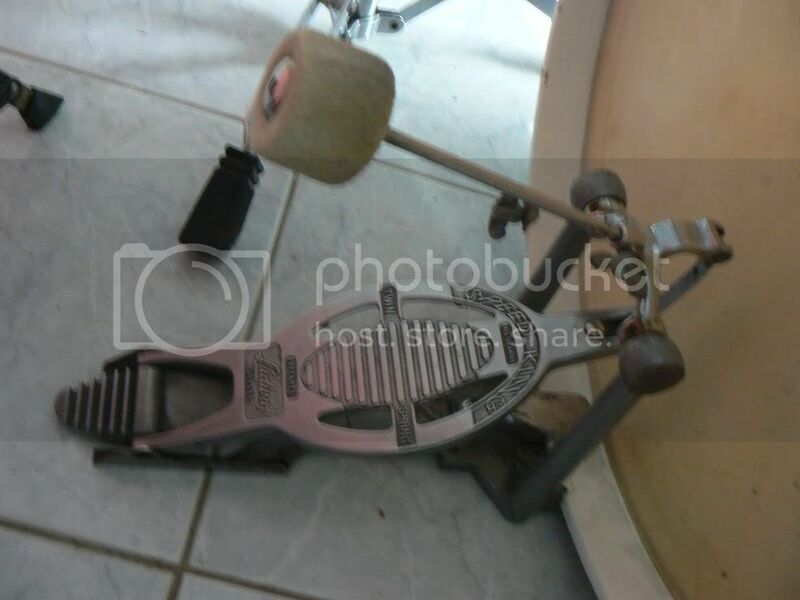 The pedal is an old (but good) Ludwig SpeedKing. any shell interior pics,yet? -----both would be good.----- I'm curious about this kit.-----still think it is Lindberg. The shells would be the defining clue. Well. That is a TROMSA shell, TROMSA screws and washers,TROMSA spurs,TROMSA interior fastening style for the tom mount and the lugs ; I have seen on both TROMSA and Lindberg drums.Deri lugs were similar but different. 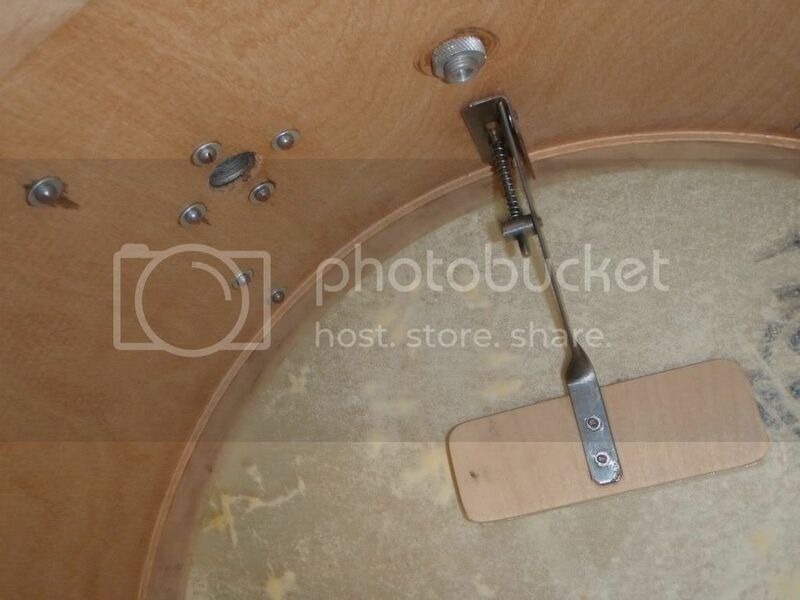 The little mount for the cymbal post , is not a TROMSA mount and the spur mounts are not TROMSA,either. While the tom mount is fitted the same as TROMSA and appears to receive a TROMSA 20mm tom arm it looks more like a mount from a Deri drum as do the spur mounts. Here is a possible explanation for the assemblage of the parts from two drum factories in the production out of one of them. Sometime late in the 50's, one of the partners in Deri(Mr. Rimmel, I believe) won a lottery of some kind and used the money to build a state of the art foundry. Perhaps ,prior to that, Deri, did not have a foundry and so , contracted the metal parts mfg.for their drums out to perhaps, TROMSA, who did have a foundry. So, the Deri molds and parts were close at hand to TROMSA and Lindberg Music chose much Tromsa for their drums but also bought some from Deri, in order to make them unique. All TROMSA needed to do was assemble the drums to order. If knowledge of German made drums is what you're seeking, then more and more, I am becoming a huge fan of Phil. This gentleman backs up what he says with solid research and keen understanding of the instument in question! I 'm glad that you fully confirmed my assumptions. Phil. As always, your explanations of nuances are great! Here's the snare to fill in the gap. The wrap is known as lametta ( tinsel). Last edited by calfskin; 11-23-2012 at 07:08 AM. 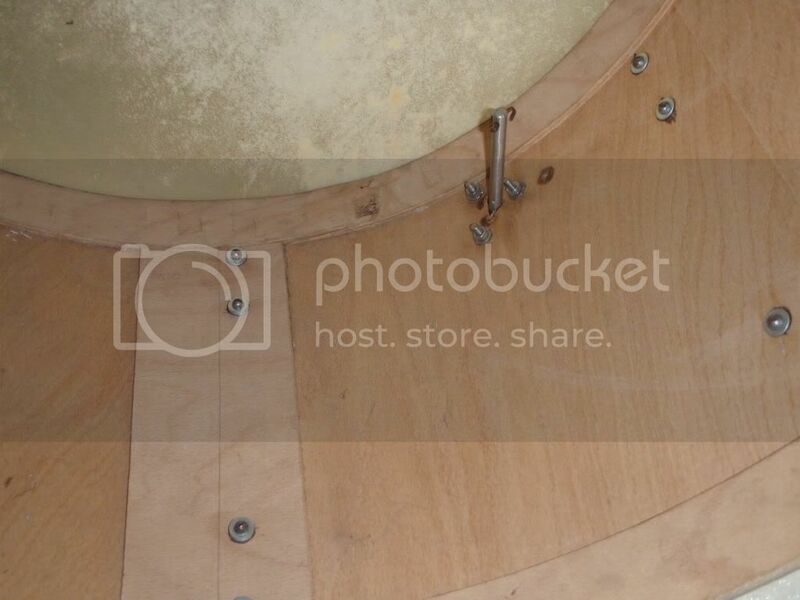 The brand on this drum is "Artist". This was one of the brands in Germany, that Tromsa was contracted to produce as a stencil brand. I have no idea , who these were for but in my Tromsa collection, I have 3 drums so badged, with each badge being different. 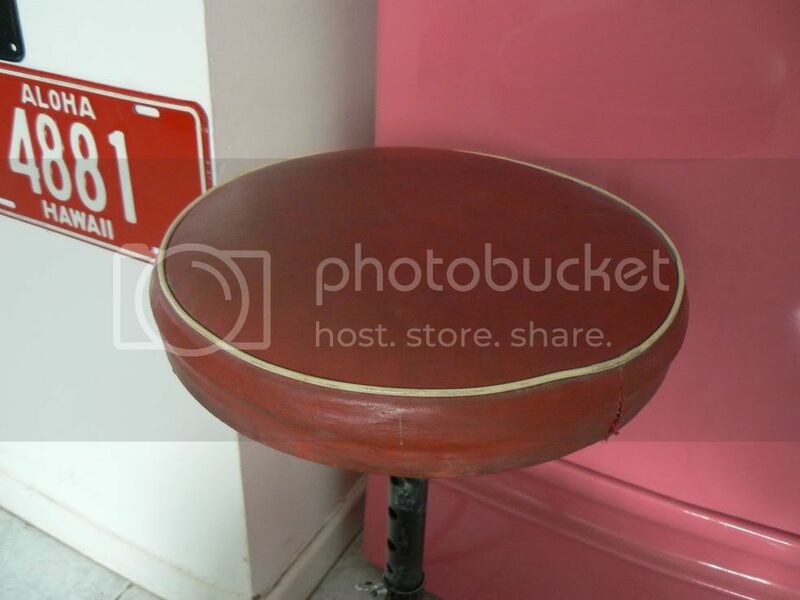 The lug style , dates from the 50's. Both Lindberg Music and Tromsa , themselves used these lugs as well. Thanks A LOT, Phil! I already did bid!